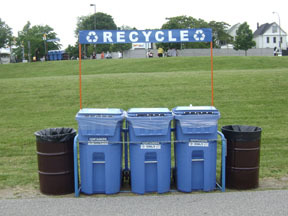 Does Your Event Have Recycling? Hosting An Event? We understand that special event coordinators are busy with the task of organizing and managing their event, without adding recycling collection into the mix of responsibilities. That’s why we’re here to help! The Essex-Windsor Solid Waste Authority (EWSWA) is prepared to work with you and your organizing committee to make recycling work at your special event. The Essex-Windsor Solid Waste Authority offers a free special event recycling service in order to make special events more environmentally friendly. Of course each regional special event is different and we are more than happy to discuss your recycling needs with you. Our goal is to ensure maximum capture rates of recyclables and minimum contamination levels. The direct benefit to you is reduced garbage generation, which results in a savings in refuse bins tips and disposal costs. If you are hosting a special event and require recycling services, please contact the EWSWA in order to organize a recycling program for your event. This is a year round, FREE service. Register early, first come, first served. For more information or to arrange for Special Event Recycling call 1-800-563-3377 (Essex County & Windsor Area only). You can fill in an on-line form at the bottom of the page if you would like to submit your event information electronically. One of the EWSWA staff will call to confirm recycling services at your event. Note: Requests must be submitted two weeks in advance of the event date.